“HOW many?” the gas station attendant expectantly asks. “I’m just starting off on a little trip so you’d better fill it up,” the rider replies. “Let me have seven cents’ worth. 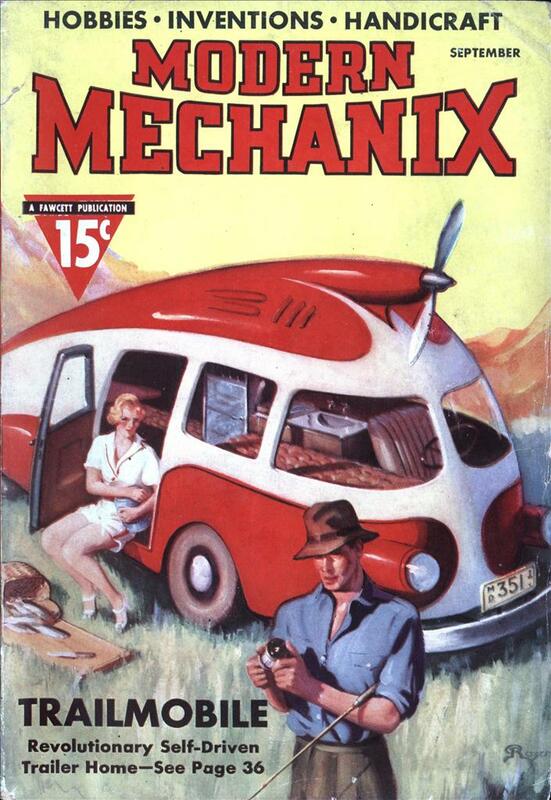 And also, fill up the emergency tank.” He takes a pint bottle from his pocket and hands it to the attendant. Only a vehicle capable of making one hundred or more miles to the gallon could make possible such a stop at a gas station. 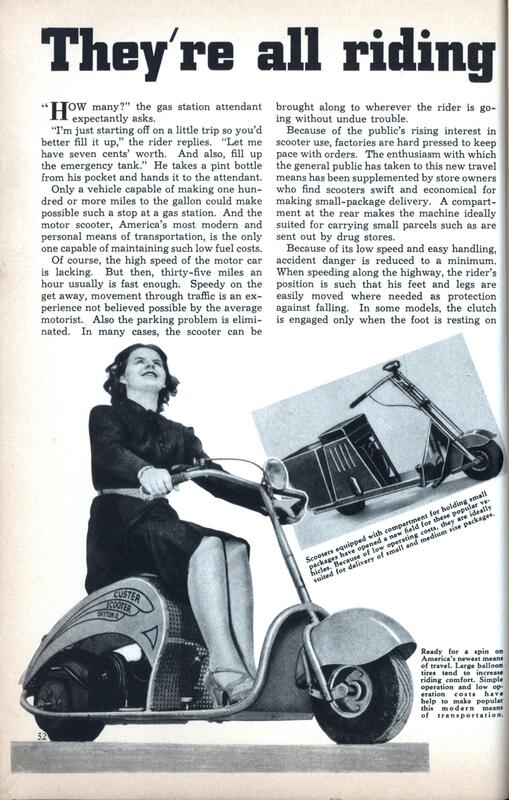 And the motor scooter, America’s most modern and personal means of transportation, is the only one capable of maintaining such low fuel costs. Of course, the high speed of the motor car is lacking. But then, thirty-five miles an hour usually is fast enough. Speedy on the get away, movement through traffic is an experience not believed possible by the average motorist. Also the parking problem is eliminated. In many cases, the scooter can be brought along to wherever the rider is going without undue trouble. Because of the public’s rising interest in scooter use, factories are hard pressed to keep pace with orders. The enthusiasm with which the general public has taken to this new travel means has been supplemented by store owners who find scooters swift and economical for making small-package delivery. A compartment at the rear makes the machine ideally suited for carrying small parcels such as are sent out by drug stores. Because of its low speed and easy handling, accident danger is reduced to a minimum. When speeding along the highway, the rider’s position is such that his feet and legs are easily moved where needed as protection against falling. In some models, the clutch is engaged only when the foot is resting on the pedal. When the rider desires to stop, the foot is taken off the pedal and placed in position for balancing the machine until it comes to a stop. When necessary the machine may be brought to a quick stop by use of the brakes, conveniently located. In a survey of state motor vehicle regulations as applied to motor scooters, all those requiring operator’s license for car operation also required them for scooters. Registration certificates also are required before the scooter can be operated. The popularity of motor scooters has received an added boost from the fact that they are able to travel along narrow lanes, and even wooded paths, a feat that can be duplicated by few other powered vehicles with the possible exception of the motorcycle. The popularity of the hobby trains which leading railroads have been running to cater to cyclists, camera fans, canoeists, etc., may soon result in the operation of trains to special scenic points at which the passengers can leave the train and travel on country roads upon motor scooters provided and rented by the railroad. Without a doubt, such trains would be booked for reservations weeks in advance. Another factor that tends to increase the popularity of motor scooters is the operation of “rent-a-scooter” booths at parks and amusement centers by concessionaires. Mad Magazine once had an article in which they predicted that the motor scooter would mean the end of walking.